“This autobiography is the story of a beautiful and gifted woman who freely chose to live as a second wife to a brilliant teacher she met while attending the Brigham Young University. 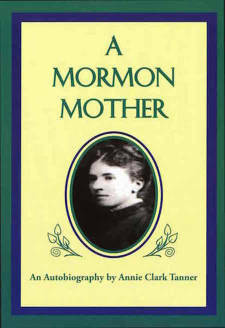 Her marriage took place in 1883 when polygamy, or ‘plural marriage’ was widely practices and strongly defended by the Mormon religion.” These are the words of Obert Tanner, Annie Clark Tanner’s tenth child, who introduces this significant contribution to Mormon history. Most impressive in this newly discovered volume is its objectivity—possibly the most objective in all of Mormon literature. Annie Clark Tanner, though influenced by the period of time in which she was living, confronts her problems with a remarkable understanding and wisdom. She was an interesting woman, and her story provides a personal view of one aspect of Mormon history that has not been well documented until now. Annie Clark Tanner was born September 24, 1864, in Farmington, Utah. She wrote this autobiography for her family in 1941, the last year of her life. She was a woman whose satisfaction came in accomplishing what she believed to be her duty. Her writing reflects a native optimism and almost inexhaustible energy. She saw life through, with misgivings about herself, but with sympathetic understanding and compassion for others. Obert C. Tanner, the author’s youngest child, now a professor of philosophy at the University of Utah, was a participant and an observer of many of the events in Annie Tanner’s life. His introduction places this intriguing personal history in the proper perspective of time and circumstance.